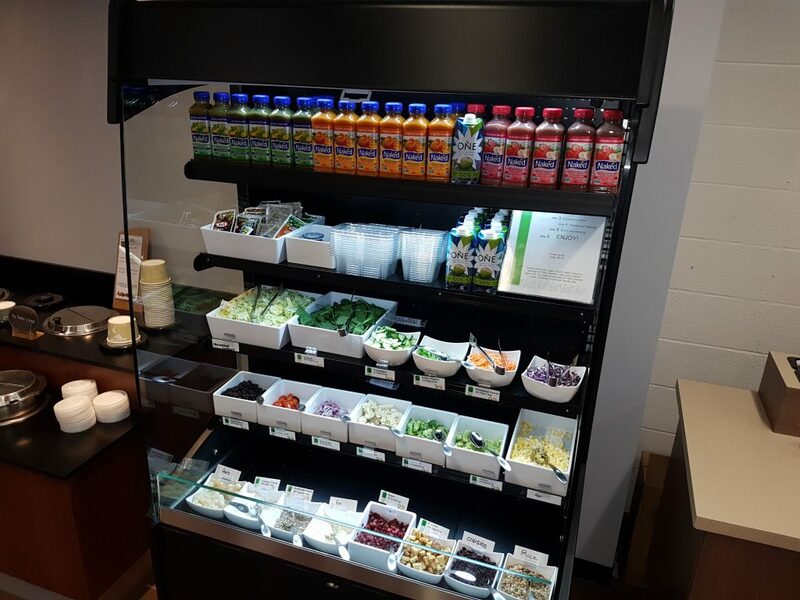 Salad bar inside dining hall at Loyalist College cafeteria replaced Romaine lettuce with Iceberg. Photo by, Matthew Morgan QNet news. BELLEVILLE – Belleville restaurants and grocery stores moved quickly in reaction to an E.coli breakout linked to romaine lettuce. Some local restaurants, including Loyalist College’s cafeteria, have acted quickly in taking the necessary precautions to prevent their customers of the risk of infection after receiving a notification from head office received on Nov. 21, says Andree Mathurin-Scott, food service director for Aramark at Loyalist College. Aramark removed all of its food containing romaine lettuce across Loyalist College’s campus due to North American-wide alert about an E.coli breakout Wednesday morning. Some grocery stores took the same approach and have already removed romaine lettuce off their shelves. Grégoire Geneviève, the communications manager for Metro, says ever since the warning was issued, the national chain temporarily removed romaine lettuce from all their stores. ” We have preventatively and temporarily removed from our shelves (Metro and Food Basics stores) all romaine lettuce, following the public health notice that has been issued yesterday,” Geneviève says. A few local restaurants may have not been impacted directly to the E.coli outbreak. Some owners say they don’t even offer romaine lettuce. They offer their customers alternatives and other options such as kale and other lettuce products. Burger Revolution owner Jeff Camacho says it is terrible that E.coli has been found in romaine lettuce. But he says they don’t use or even serve it in any capacity for their customers. Local downtown restaurant owner Abraham Ramos, who operates Chilangos Mexican Restaurant says that they don’t use romaine lettuce. Another owner, John Cairns, Earl and Angelo’s, says he was notified on a couple different occasions about the E.coli outbreaks. “The last one was in June and the other one was in February. So, Earl and Angelo’s takes a pro-active stance and position, especially when it comes to our higher end and quality of products,” Cairns says. “We actually discontinued using romaine and were actually using kale and baby kale, we’ve been doing that for about four months,” he says. His main concern is the safety and health of the public and his customers alike. He also said that he doesn’t see bringing romaine lettuce back in the foreseeable future. Public Health Agency of Canada, the agency responsible for food recalls, released a warning Nov. 20, saying there is an outbreak of E-coli linked to romaine lettuce across the country. There are 18 confirmed cases of E.coli illness investigated and three were in Ontario and the remaining 15 were in Quebec. Six individuals have been hospitalized and one suffered a severe complication due to the E.coli infection. No deaths have yet been reported. A similar warning was sent out across the United States by the Federal Drug Administration (FDA). The ages of the people that had become ill range from 5-93 with the majority being female. This outbreak is a specific strain known as E.coli 0157 and it’s more likely to cause severe illness. Young children, pregnant woman and the elderly are most at risk. Normally people that get infected by an E.coli infection recover completely on their own, however, in certain cases, some people require medical assistance and require hospital care. Some people may not show symptoms but can still be able to pass the infection on to others. Long-term health effects can include stroke, kidney failure, and seizures which could even result in death. Anna Maddison, the Senior Media Relations Advisor with Health Canada and the Public Health Agency of Canada, says that the source of the outbreak has been identified as romaine lettuce and that past laboratory analysis indicates that this outbreak is genetically related to a previous E. coli outbreak from 2017. “Protecting the health of Canadians from food-related illnesses and keeping Canada’s food supply safe from contamination is of the utmost importance to the Government of Canada,” Maddison says. “We are working closely with our provincial, federal and U.S. public health and food safety partners to investigate this E. coli outbreak affecting individuals in Ontario and Quebec, as well U.S. residents in several states,” she says. Which means it’s the same strain of E. coli is causing illness in Canada and the US that was seen in 2017 and it suggests there may be a reoccurring source of contamination. The outbreak investigation is ongoing, to try to determine the possible causes of contamination in the romaine lettuce. She says there is no current food recall’s and that the notice was listed as a severe warning to all romaine lettuce and that further investigation still has to take place to determine the specifics on what brands or distributors of the product are causing the illness with regards to this outbreak. Maddison says there is no evidence to suggest residents in other parts of Canada are affected by this outbreak. Dr. Piotr Oglaza, the Medical Officer of health for Hastings Prince Edward Public Health, says the notice that came out is not a recall but more of a warning and that when something like this happens that it’s quite common for such a thing to happen and that further investigation needed to be done before any formal recalls of romaine lettuce can take place. Oglaza says that generally, the E.coli is basically a bacteria commonly found in the gastrointestinal tract in all mammals. He says that this particular type of E.coli causes bloody diarrhea and rarely some individuals may develop hemolytic-uremic syndrome, (HUS) which basically is a complication from that type of E.coli and to put it in simple terms it basically shuts down the kidney. “In my understanding based on the information from the Public Health Agency of Canada, we do not know what is the source of that E.coli in that romaine lettuce,” Oglaza says. Serious complications from an E. coli infection are rare, but they do happen from time to time, which is why it is so important for Canadians to pay attention to the advice in the public health notice.